Pop Quiz Hotshot: Name the game where you’re on a space station overrun with Aliens that you need to fight to survive. Uh...okay. Not quite what I was looking for. Let’s try again: Name the game where you’re on a space station overrun with Aliens wrapped in a twist-filled plot, and gameplay that emphasizes cunning over brute force. Ugh. Alright...what’s the game where you’re on a space station overrun with Aliens pretending to be coffee mugs? Where you use a gun that can make stairwells? Where you're led around by a robot memory of yourself you created pre-amnesia? The one that came out this year? Yes, you got it! Unfortunately, I’m assuming the uncertainty in your response is because you're not sure if that's the game I'm describing, because you, like many gamers, didn't play it. And that is a goddamn shame. Prey is a gem. It’s a wonderful game that blindsided me with it’s quality, far and away the best “immersive sim” since the original Deus Ex. But that’s not what I want to talk about. I’m more interested in why so few people played it--particularly when many of the people who did considered it their game of the year. Why did Prey flop? And why did many reviewers not know what to make of this game? Put simply: Prey was a marketing failure from beginning to end, ensuring that the people who would most enjoy it stayed away from actually trying it. And now I want to take a look at how this happened and what marketing issues led to this result--because this game deserved better. So one of the key ways advertisers promote a product is by showing how it’s similar to something you already enjoy. They say, “ Hey Buddy, here’s something that’s kind of like the thing you love, but different enough that you can still enjoy it like new!” I get it, this is marketing 101. The problem is that Prey failed to make its case for “like new”. And it starts with the tone. One of the toughest things to sell about a game is it’s tone. Sure, some great screenshots might be able to show a game’s atmosphere, but tone is the total sum of it’s parts--everything from the art, to the sound design, to the music, to the story, and even the basic moment-to-moment gameplay combine to inform a game’s tone and mood. Prey failed miserably to explain it’s tone. Check out this launch trailer. Did you see that? That was the final piece of marketing expected to sell Prey, and it’s a mess. Tonally, it resembles a cheesy action-movie set in space, filled with generic dialogue and endless clips of shooting at inky black enemies. Morgan comes off like any tough-guy in a million space marine games where the fate of the world rests on one man’s shoulders. Even the tagline is terrible. How did "Fight the Invasion Now" get greenlit? This could describe literally hundreds of games. It’s bland, non-descript, unmemorable, and doesn’t tell you a damn thing about the game except you fight things. To me, it’s clear that either the marketing team wasn’t sure how to capture the game’s tone in promotional materials, or they thought that doing so would turn people off from the game. Unfortunately, the solutions they came up with only served to remove anything interesting about the game from the promotional materials. Let’s briefly touch on two other trailers and how they have the same issues. The Typhon Trailer: This trailer discusses the game’s enemies, without showing why they’re interesting to fight. Mimics look like every spider crab you’ve ever seen since Half-Life 2, except that these ones just happen to occasionally turn into an office chair. Why? Because of the quick-cut nature of this clip. It doesn’t capture the experience of them actually fighting them. It doesn't show you seeing a stash of ammo across the room, breathing a sigh of relief, then running up to it only for it to turn into inky black tendrils and mess your day up. In the video, they look like uninteresting cannon fodder, not like the creepy, unnerving things they are. This is a huge issue, because visually, most of Prey’s enemies look bland and uninspiring, but it's the way you confront them that makes them each interesting. The Neuromod Trailer: This trailer should’ve been a home run, but it runs into the same problem. I understand the thinking behind clip--the game has plenty of cool powers, and they decided to emphasize the similarities to games like Bioshock and System Shock 2. The problem is that it doesn’t look different. The first powers it shows are things you’ve used in other games. Mimic--arguably the game's most interesting mechanic--is literally the last power shown, when it should be front and center. The other problem is they mainly show “combat” powers, and not how they can be used in interesting ways. If they just created a video on mimic, showing you becoming chairs to hide from enemies, morphing into sentry guns to shoot them, and then becoming a mug to roll into a secret area, that would’ve been more interesting than this whole trailer. I could go through all the trailers, but they all run into similar problems. They show aspects of the game without showing why they’re compelling or different. They tried with this one which is a longer walkthrough of a short area early in the game, but it still doesn’t quite work, mainly because doesn’t show you just how many ways to play there are. And the shame is that there was a very easy trailer format they could steal. Remember this trailer for Deus Ex: Human Revolution? They could’ve easily done the same thing for Prey, showing someone going through the same situation multiple different ways and using completely different tactics and powers each time. This was something worth copying, and they didn’t. As it stands, the best trailer for the game is still likely this one from very close after it's announcement, meaning that the best piece of marketing material created came out a full year before release. Every AAA game has “wow” moments, no matter the genre. If it’s an action game, it’s that giant set-piece that blows everyone away ( think the Africa chase they showed in the Uncharted 4 reveal). If it’s a horror game, it’s typically a pulse-pounding chase scene or a scene so gorey and scary you’re immediately intrigued. Prey’s trailers showed no WOW moments, and that was a major detriment towards gaining interest. Prey has hands-down the best zero-gravity sequences I’ve ever played, and the first moment you go outside in the cold vast, black space sends chills up most players spines. Showing that moment for the first time while the player drifts out, seeing the grand spaceship for the first time, would’ve been a great “wow” moment to show in a trailer. Maybe they’d want to show something with a bit more violence and horror. To that end, I think your first trip to Crew Quarters and meeting the possessed crew members would fit the bill. Watching them scream as they’re forced towards you and blow up on impact, all while trying to find the thing controlling them could’ve made a great little sequence ( bonus points if you model it after the Deus Ex trailers and show multiple ways of handling the situation). This would be a great moment, and could build off of the first spacewalk. Show the character heading out to the Transtar sign out of curiosity, finding the body there, and turning on the new message. Then let them drift back out and see it, maybe with some added dialogue about how much worse things are then they realized. It’s a great, creepy moment, that adds a layer of mystery. The point being, they never showed any moments that made you curious or wonder what the game had in store, when these type of scenes would've better exemplified the game and what made it stand out. By now you’re probably wondering: Nick, if the marketing was so terrible, how come you ended up buying the game? Good question, random internet reader. The answer: A demo. You see, I was pretty bored in early May. I had finished Horizon: Zero Dawn in April and hadn’t been playing much since. I had a long weekend coming up, and my girlfriend was going to be out of town the entire time, and I was jonesing to really sink my teeth into a new game. Prey didn’t interest me at all, but I was desperate. And in that desperation I decided, what the hell, let’s try that Prey demo. And to my own surprise, I loved it. The tone, the mystery, the gameplay--everything just clicked with me. I wound up buying it later that day, and spent that weekend getting through the first third of the game and loving it. At the end of the weekend, I told two friends of mine how much they enjoyed it and both of them were surprised, because neither of them thought it looked interesting either. But after hearing from me, they each played the demo, loved it, and bought their own copies. I think this demo was a much more valuable asset than Bethesda knew at the time, drawing the right audience to the game. Which was unfortunate, because a vast majority of their marketing was drawing the wrong one. Did you hear that? It’s the collective sound of everyone reading this hurling into a bucket. Still, we have to talk about this much-maligned practice, as it’s become an integral part of any marketing strategy. Most games get sent out to influencers in advance. Sometimes it’s preview copies sent to online mag editors who a publisher thinks will dig the game, other times it’s Youtubers who are given early access to a portion of it. It’s clear that Prey did this with several youtubers, and while I applaud the move, I have to question who they wound up sending it to. I ask because there are specific people who seem to have an affinity for this type of game that didn’t receive it. SuperBunnyHop, Errant Signal, hell, even Markiplier ( if we want to go as mainstream) each enjoy games like this, with Markiplier doing a full playthrough of Prey a month or so after release. However, the fact that Angry Joe was the one who had the most prominent early footage was a problem, since by his typical reviews, this didn't seem to be a game much up his alley. Same with many of the others who received an advance copy, who seemed to only say “it’s decent”. Hell, Angry Joe didn’t even wind up doing a review of it. It felt like the team didn’t know the the best influencers to send to, or didn’t know the game as well as they needed to. Granted, I fully admit to not knowing the backstory behind this. Maybe they did reach out to more “on-target” influencers and they just didn’t bite, or they couldn’t put the content up in a timeframe that made sense to the game, but it still feels like an opportunity wasted. 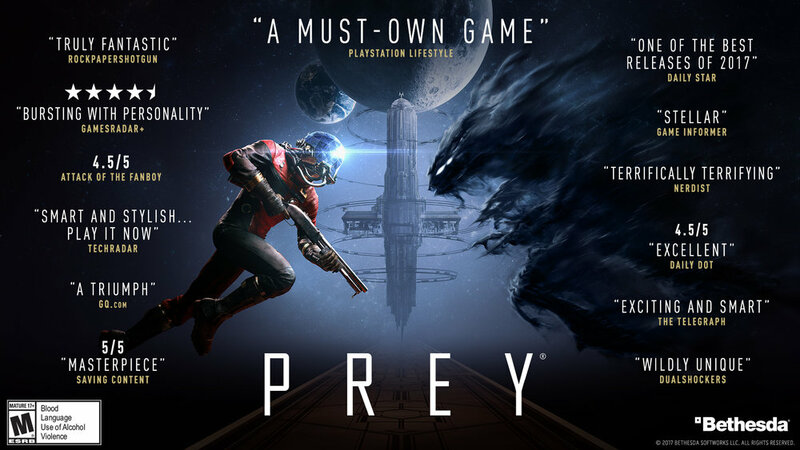 Prey received no early reviews. A few sites managed to report on the first few hours of gameplay, but across the board it launched with very few reviews, and the first one’s up were actually the most divisive, with Gamespot slapping it with a 6/10 and coloring it’s metacritic score badly--and this came out TWO DAYS after its launch. That meant that all of the initial impressions player got of the game was that it lived up to it’s trailers--that it was mediocre at best. I can’t make Bethesda change it’s policy, but it’s a shame the effect it’s having on some great new IPS. Personally, I think they should adopt a Sony strategy for games like this. Every one of their major releases--from the Last of Us, to Uncharted 4, to Horizon: Zero Dawn--has reviews come out at least a week early, sometimes two. This shows a level of confidence in a game, and the initial hype can convince many people who were on the fence that this game was worth there time. The other issue with this approach ( and something I think contributed to the lower scores) is that reviewers had to RACE through the game in order to get a review up the first week of release. Given that it’s a game who best elements show themselves when you take your time and think your way through a situation, meant that many reviewers wouldn’t see that aspect and just get frustrated that they couldn’t easily charge through it. Prey is a game where you can literally MISS the shotgun for your entire playthrough--it’s not a game that is helped by running through it. This November, about six months after release, Prey went on sale for $20 for a Bethesda promotion. While it was only for a limited time, this to me speaks of the sales struggle it’s been having--and it's a shame. Prey is a great game that was saddled with poor marketing and didn’t reach the audience it should have. I do hope that the fact it’s winding up in so many yearly Top 10 lists is will convince people to pick it up, and that the people who loved it are doing their bed to evangelize it at the end of the year will help it overcome these issues, but at this point it might be too little, too late. At the end of the day, this was a failure of understanding what made a game tick, and how to attract that audience that would dig it to pieces. I hope that the next fantastic new IP Bethesda creates does better than Prey.